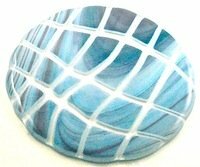 Make a fused art glass dish using cut and fused abstract shapes. This plate is made from one piece of System 96 Nautica, and one piece of clear System 96. Two circles are cut, one disc is cut into abstract strips and fused to the other disc and then slumped into a dish mold. A six inch diameter slumping mold is used for this plate. It is a matter of choice which size is used. Step 1. Using a circle cutter cut a five and a half inch disc and then cut a five inch disc from the colored nautica sheet. Step 2. Draw vertical abstract lines on the nautica disc and then some horizontal lines across. Step 3. Following the lines, cut into strips, cut across to make small strips. Keep the strips in order so they can be placed on the clear disc. Step 4. Wash and dry pieces completely, place clear circle on prepared shelf. Step 5. Arrange the nautica strips on the clear circle. Set the strips apart and glue them to the circle with fusing glue. The nautica strips should be level with the outer edge of the other circle. When the glue has dried place the shelf in the fusing kiln. Use the following glass fusing schedule. The annealing stage has been removed as the plate will be annealed during the slumping process. If fusing larger circles then the schedule may need to be adjusted. When plate has cooled to room temperature remove from kiln. Apply four or five coats of kiln wash to slumping mold. Make sure that any air holes in mold are not blocked with the wash.
Must be completely dry before use. Sit fused dics in slumping mold and place in kiln. Use the following slumping schedule, an annealing segment has been added for this stage of the process.